The Artisan Fire Pizza Oven is designed to sit atop an outdoor countertop. Sometimes being unique borders on being odd. Celebrities naming their children things like Suri, Apple or Willow. A woman wearing a multi-colored dress and a fur coat to a holiday party. You get the idea. But, more often than not, being unique is a good thing. The Artisan Fire Pizza Oven from Kalamazoo Outdoor Gourmet is definitely the good kind of unique. 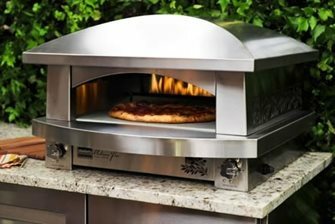 There are three things that make this outdoor pizza oven stand out from the crowd. First, it's a stainless steel countertop model that requires no installation. Simply hook it up to a natural gas or propane line and you're ready to cook. Second, it has an open flame burner in the rear and a bottom burner under the ceramic cooking surface that are on separate controls. This control over crust versus toppings allows you to cook whatever style of pizza you desire - New York, Chicago and Neopolitan. Third, since it's gas-fueled it heats up in as little as twenty minutes. The oven has a range of 350° to 800°F, a traditional wood-burning oven can take hours to reach this temperature. An open front pizza oven like this one is a very interactive form of cooking. You'll find that friends and family gravitate towards the oven and enjoy making their own pizza creations. Another benefit of the open front is that you can conveniently monitor your pizza and ensure that it is cooked to perfection. The Artisan Fire Pizza Oven comes with a door that keeps the interior clean when not in use. With a cooking deck that measures 24" by 18" this oven is smaller than built in wood-fired models. While this may mean that you can't cook multiple pizzas at once, the speed at which the oven heats and cooks will make up for this. In as little as three minutes a pizza can be cooked and ready to eat. You'll be cranking out pizzas faster than your guests can decide on toppings. Plus, the compact size of the pizza oven makes it an easy addition to new or existing outdoor kitchens. If you want your backyard to be the good kind of unique consider an Artisan Fire Pizza Oven. The cost for this oven is $6,495. Allow 4 weeks for the built-to-order oven to ship. You may also want to purchase Kalamazoo's Pizza Master's Essentials Kit which comes with all the pizza cooking tools you'll need.